With many of the big name tourist towns up and down the coast celebrating their ferias in recent months you could be forgiven for overlooking the Feria in Nerja. After all, the town is a little out of the way on the eastern edge of the coast and it can’t compete with the size of Malaga or Marbella’s fairs but it’s well worth a visit. It’s true that really, many of the ferias along the coast all blend into one another. They’re all very similar, with dancing and music, amusements for the kids (and young at heart) and of course the obligatory eating and drinking, so why is Nerja different? What sets it apart from the feria competition? The irony is that the very thing that may dissuade you from visiting the town’s feria is what makes it and Nerja itself a little special. Let’s not pretend that the area is not a tourist hotspot but Nerja’s location and general quieter nature away from the more commercialized western side of Malaga is what gives this occasion something a little extra. Nerja’s feria very much provides a concentrated dose of Andalusian culture, lifestyle and mentality, all wrapped up in charming little corner of Andalucía. The main body of the fair is found almost in the centre of Nerja with the old town to the east and the more recently built areas to the west, just a stone’s throw from the Balcon de Europa and the church of El Salvador. You’ll find no purpose built areas on the outskirts here. The feria is right in the thick of the population and as a result takes over the town during the five day long celebration. There are little events all over the place with music nights, dances and special events. Many of the restaurants and bars put out street stalls serving snacks to the public, particularly around Plaza Tutti Frutti in the new town where the ‘day fair’ is held. Pretty much everywhere you go you’ll find people having a good time at this good natured, family friendly event. 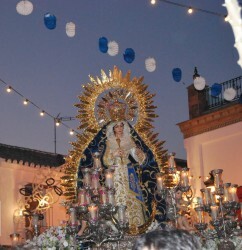 Of course all of this has its roots in religion and officially that’s what the feria is all about. 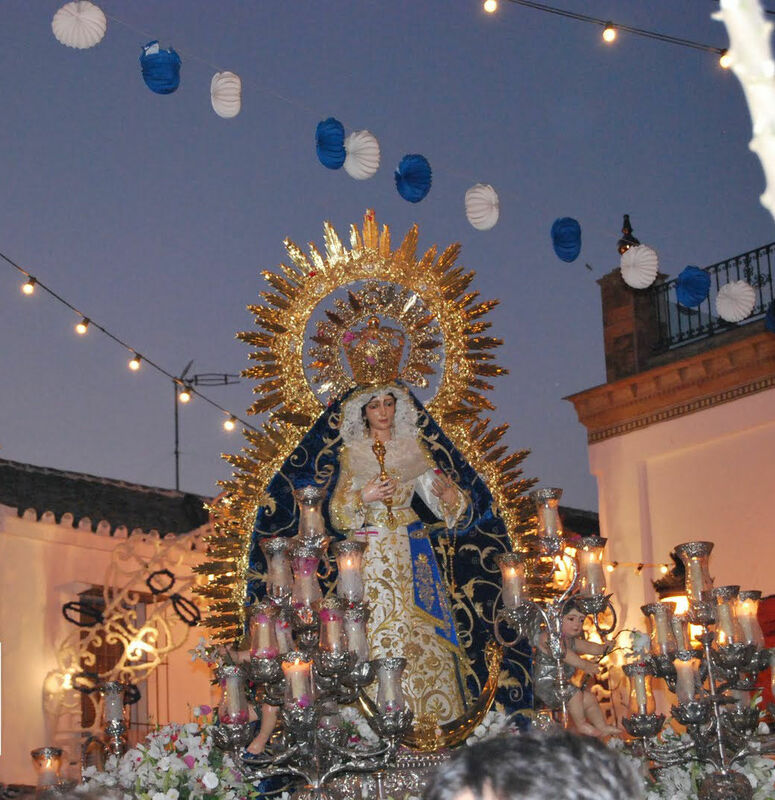 The festivities, with their origins dating from 1804, are held to honour the town’s patron saint, ‘Our lady, Virgin of Sorrows’ and ‘Saint Michael Archangel’. 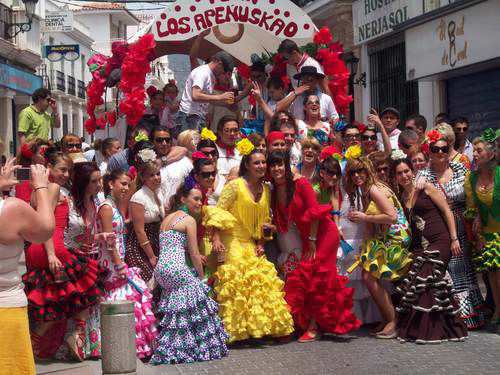 Originally they were held in the month of September however mayor Francisco Bueno Morilla moved the occasion to October in 1874, a decision which to this day remains a questionable one given that the Feria of Nerja commonly arrives hand in hand with at least a little rain. Every year at the end of September, the patron saint is carried in procession from its chapel, La Ermita de Ntra.Sra. de las Angustias found in Plaza de la Ermita, to the church of El Salvador, on the Balcon de Europa. It remains here where locals and visitors can come, pay their respects and worship until the 10th October when, following mass, the Virgin is returned to her usual resting place accompanied by Saint Michael Archangel. The feria takes place each year during the second week of October with the timetable for the Nerja Feria 2012 now available. So why not jump in the car, take a ride down the coast and visit the Spain that you first came here for?